New research from Evaluator Group highlights how and where the investments are being made. Hybrid Cloud is still very much a work in progress. It was clear from our interviews that there is no one path or one-size-fits-all solution for Enterprise IT. Cloud computing is fundamentally shifting the way enterprises deliver information technology to business users. This shift started with SaaS applications and is now rapidly sweeping through the data center. To better understand this shift and the current landscape, Evaluator Group conducted an incisive survey and in-depth interviews of enterprise administrators who now focus their IT management skills on hybrid cloud initiatives. From these data sources came an illuminating view of the advancement of cloud computing in the enterprise. 62% of survey respondents said hybrid cloud is their long-term future and 58% said they would increase their hybrid cloud workload in 2017. While the recent popularity of hybrid cloud solutions is widely known, the data also revealed many surprises. These included security concerns, where respondents cited network security as a greater concern than public cloud security, and product maturity and compatibility issues, where nearly 50% of respondents said they had concerns. These surprises all lead to one conclusion: Vendors of hybrid cloud solutions have work to do. 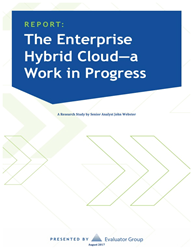 After compiling and analyzing this data, Evaluator Group today announced the worldwide release of the research study, “The Enterprise Hybrid Cloud—a Work in Progress”. This report provides current insight into where enterprise IT end users are going, as well as their concerns and buying preferences. It also provides a window into the successes and failures of IT peer groups currently engaged in hybrid clouds. The report reviews a collection of the most significant solutions available from both vendors and the open source community. Evaluator Group Inc., an IT information management and data storage analyst firm, has been covering Information Management, Storage and Systems for over 15 years. Executives and IT Managers use us daily to make informed decisions to architect and purchase systems supporting their digital data. We surpass the current technology landscape by defining requirements and providing an in-depth knowledge of the products as well as the intricacies that dictate long-term successful strategies.